St John Ambulance & Rescue Service employees have received Commendations for their exemplary actions in September this year. 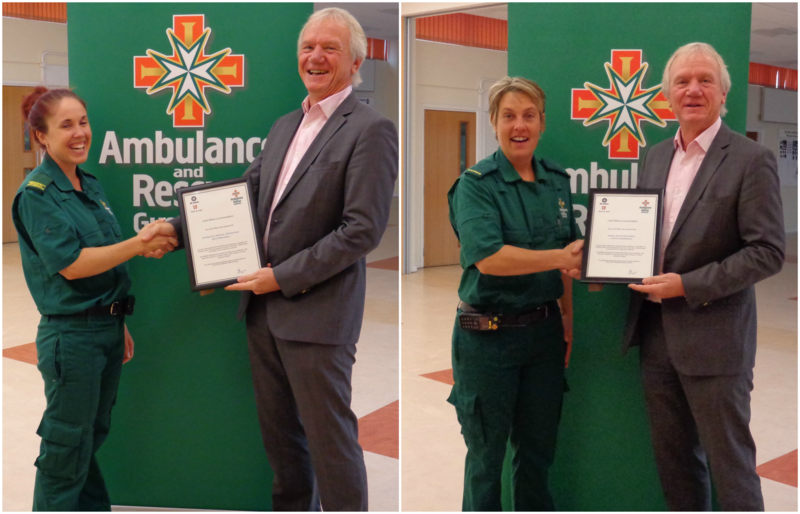 Lorna Harborow, a St John Paramedic and her colleague, Amy Parnwell, an Emergency Medical Technician, were both presented with their Commendation certificates by the Chairman of St John Ambulance & Rescue Service, Steve Le Page last month. During September, Lorna and Amy responded to a Mayday call with the RNLI St Peter Port Lifeboat, where a casualty was suffering from a dislocated hip on a stricken yacht approximately 1.5 miles north of Herm. Whilst the Lifeboat crew rescued the yacht the ambulance staff were transferred from the Lifeboat onto the vessel to provide medical treatment to the injured crew member during which they endured a long tow back to St Peter Port in rough sea conditions. Both of them were exposed to the elements during the process, but were stoic in carrying out their duties and extending care to the patient with his extremely painful injury. On arrival in St Peter Port harbor they transferred the patient to their emergency ambulance and despite being cold and wet continued caring and monitoring whilst en-route to hospital. Once they had admitted the patient to A&E and with little time for reflection, they were diverted to a serious road traffic collision where they provided medical treatment to a critically ill casualty. Jon Beausire, Chief Officer of St John Ambulance & Rescue Service said that their actions were above and beyond what is normally expected and they were both extremely deserving of these Commendations. A Commendation is a certificate awarded by the Chief Officer for performance which is outstanding, courageous or exemplary. It may be awarded as a result of notification by a member of the public, healthcare professional, a senior officer of the ambulance or other emergency service.